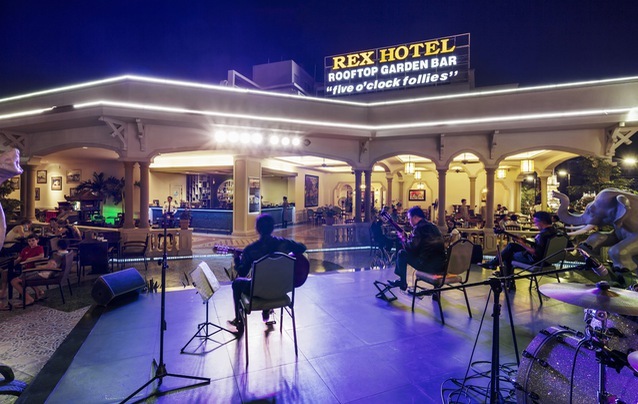 The Rex Hotel Saigon has always been proud of its history. The Rooftop Garden Bar is its most famous feature, listed as one of “1000 places to see before you die” by American travel writer Patricia Schultz. The bar has welcomed many visitors, in particular American officials and journalists during the war years of the 60s and 70s. Time spent at the Rooftop Garden Bar was peaceful and happy, as it remains today, with elephant statues and a rotating golden crown. The “Five O’clock Follies” is a familiar expression reminding one of the press briefings held at the Rex during the American War. This name came about because every day, at 5 o’clock in the afternoon, the press gathered at the Rex to receive briefings from the US Army. These briefings were so regular that reporters began referring to them as “The Five O’clock Follies”, and they were held in the Rooftop Garden Bar. Many guests visit every time they are in Ho Chi Minh City to remind themselves of the Five O’clock Follies. The names Rex Hotel, Rooftop Garden Bar, and “Five O’clock Follies” stick together and have stood as a witness of history throughout the years. And the name is used for the Rex’s signature cocktail, which every guest should try at least once. It’s a blend of a little spice from Bacardi rum, the sweetness of cucumber, and a touch of sour from lemon juice, together creating a cool and light taste. Enjoying the cocktail in the airy setting of the Rooftop Garden Bar is a great way to relax. Besides this signature cocktail, its professional bartenders also make many others with the special taste of the Rex. Our Happy Hour is held every day, when customers can try different cocktails with family or friends in a historical space. So, come to the Rooftop Garden Bar - one of the best in Southeast Asia as voted by Newsweek magazine in 1996 - to discover how exciting it is! Christmas is the most wonderful time for family reunion and friends gathering.